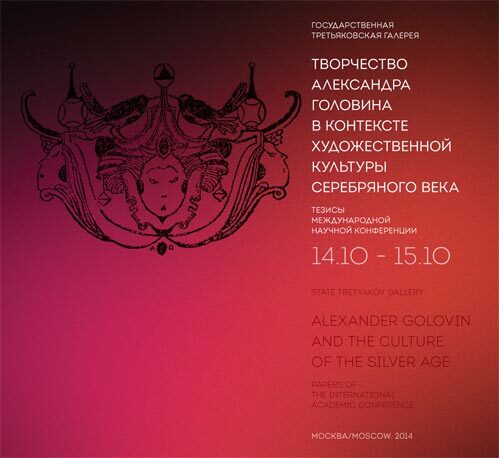 The paper of Olga Kostina on the International academic conference "ALEXANDER GOLOVIN AND THE CULTURE OF THE SILVER AGE" (14.10 - 15.10, State Tretyakov Gallery). The practice of publishing special issues dedicated to the oeuvre of major artists whose anniversary exhibitions take place at the Tretyakov Gallery has become a tradition for the “Tretyakov Gallery” Magazine, a tradition that is interesting and beneficial to the cause of “serious” research into art history; I would also call it innovative. The multi-dimensional nature of the magazine, when combined with a fragmentary approach characteristic of a magazine article as a genre, opens up possibilities for a comprehensive insight into the many aspects of an artist’s personality. The “Tretyakov Gallery” Magazine has made a winning and fruitful use of a periodical’s ability (though its assemblage of articles) to reconstruct, in William Blake’s words, “a world in a grain of sand”. When the catalogue and the magazine’s special issue, two separate publications dedicated to the same exhibition, become available at the same time, one could not help comparing them. The 480 pages of the beautiful catalogue, with articles covering influential research on various aspects of Golovin’s oeuvre, gave a broad, sweeping, elegant, and concise picture of the master and his art; the catalogue is illustrated with images of all exhibited works and provides a detailed list of research publications. Here, the editors, organizers and curators of the exhibition, as well as those who contributed their articles, focused on Golovin’s personality and art as a whole, as a historical and cultural phenomenon. Consequently, there remained a certain distance between the public and the artist – we saw him in broad and essential terms (“We should step back for better observation”), like a monumental sculpture cast in bronze, or better even, like a statue that emerges from a “marble rock” when the sculptor carves away everything “superfluous”. Everything proved different with the magazine. Episodes from Golovin’s biography were recreated “on a small scale”, with the opportunity to examine them as closely as possible, in detail, from the typical features of his art to his personal idiosyncrasies, surrounded by all those things that might have been “out of place” in the catalogue. Thus, Golovin’s mysterious, reticent (due to his character) personality, mentioned in quite a few articles, both in the catalogue and the magazine, is “deciphered”, made easier to understand – if you will, made more human, and as a result, familiar and warm, with the emphasis on the latter. This very intimacy and warmth, the result of a “personal relationship” that the authors of the articles developed with the artist through the study of his art, archives, letters and memoirs – this closeness is arguably the most valuable trait of the “Tretyakov Gallery” Magazine’s special issues. In this context, it would be impossible not to think back to the 2012 “Pokhitonov” special issue: for the first time ever Ivan Pokhitonov (one of the most refined painters of Russia and Europe, who was hardly known to the general public before his anniversary exhibition), was portrayed not only through the rich lyricism of his unique artistic expression, but also through his correspondence and the memoirs of his contemporaries as a sensitive and gentle soul, an artist who worshiped nature and was entirely dedicated to his work. Unlocking the mystery of the artist’s personality was no less important in the case of Alexander Golovin. His art is in no way “confessional”; it may even be called “anti-confessional”, a trait that is a hallmark of his artistic expression. A man who loved and created a great deal of work for the theatre (making the abundance of theatre-related articles in the magazine quite understandable), Golovin seems to be “hiding” behind the symbolism and associations of his idiom, behind the decorativeness of Art Nouveau. In his portraits, even those of children, Golovin painted his models as characters on a theatre stage. More than that, most of his models were members of theatre-related professions; he created large-scale, heroic images. His landscapes look like stage designs, and his still-lifes – like depictions of luxurious theatre props. Like all Romantic artists, Golovin always saturated his works with additional cultural references, a tendency driven by the overall artistic atmosphere and style at the turn of the 20th century. This makes his images somewhat “monumental” and obscures the artist behind them. The special issue of the “Tretyakov Gallery” Magazine has done a great job of reconstructing the artist’s character and his great talent, while also revealing precious details of his personality. The cover image, unusually for the “Tretyakov Gallery” Magazine, offers the first testament of the diversity that remains so characteristic of Golovin’s oeuvre. Most of the time, large fragments of artworks are chosen as images for the cover; occasionally, reproductions of entire pieces. In this case, the image is that of the exhibition space, with paintings on the walls and theatre costumes displayed behind glass. This is not just a “prelude” to the special issue, but also an illustration to the first article, by Eleonora Paston, where she explains the concept behind the exhibition – the organizers’ desire to show Golovin as a versatile artist. In it, Paston refers to Militsa Pozharskaya: “both his incarnations, those of a painter and a set designer, merged equally and indivisibly”. Even though this article (as well as another one, by Olga Davidova) approaches Golovin’s oeuvre “from a distance”, the author delivers her message with a free, discussion-like intonation, something that is expressly appropriate in a magazine format. The rest of the articles do “take apart” the artist’s work; they are, however, ultimately instrumental in creating a “three-dimensional” image of Alexander Golovin. For example, Irina Shumanova’s article “Golovin and Diaghilev” is dedicated to a single, thought lengthy episode – but what a dramatic, suspenseful narrative it provides! The stories of Golovin’s cooperation with Stanislavsky (by Margarita Chizhmak) and Meyerhold (by Natalya Makerova) are equally dynamic. And note Yelena Terkel’s article about the noble, deep and rich professional friendship between Golovin and Yelena Polenova! Terkel starts her article: “When we look at paintings, we often wonder what the artist was like in real life, what excited him, what kind of people surrounded him, what inspired him to create his masterpieces… The artist’s inner world and his creative process remain almost always ‘off the record’.” The Magazine’s special issue is devoted to exactly that elusive “off the record” part. The tension and cadence of the magazine’s authors’ different approaches to Golovin, the artist and the person, are dictated by the genre of the magazine and provide the opportunity to “flesh out” the master’s image through texts that are easy to read and limited in length. What exactly does art history gain from such an approach to an artist – meticulous, itemized, relying on the artist’s social circle, sometimes facts that are incidental to the artist’s work? Art history and reviews as the subjects of journalism are valuable to “serious” art research first and foremost because they bring the artist’s work, the twists and turns of his biography, all the ups and downs of his everyday life and feelings into the art scene, into art history, and further into wider culture.